It is not a question of reaching a reassuring conclusion at no matter what cost, nor of forgetting at the end what has been found on the way. It is from doubt that certainty will come. So we must measure the extent of it. Let us repeat that all belief is passion and makes us beside ourselves, that we can believe only by ceasing to think, that wisdom is a resolution to be irresolute, that it condemns friendship, love, and public life. And so here we are back to ourselves again. And we find chaos still, with death, the emblem of all disorders, on the horizon. Cut off from others, cut off from the world, incapable of finding within himself…and in an inner relationship to God the means of justifying the world’s comedy, Montaigne’s wise man, it would seem, no longer has any conversation except with that life he perceives welling madly within him for a little while longer, any resource except the most general derision, any motive except despising himself and all things. In this disorder, why not give up? Why not take the animals for a model–these neighing horses, these swans who sing as they die–why not join them in unconsciousness? The best thing would be to go back to the puerile security, the ignorance of beasts. Or to invent, against the feeling of death, some natural religion: the extinction of a life is the way to a thousand other lives. This movement is to be found in Montaigne. But there is another one, too, which appears just as often…[T]he mind’s movement and irresolution are only half of the truth. The other half is the marvel that our volubility has stopped, and at each moment stops again, in appearances which we may indeed show cannot withstand examination, but which at least had the air of truth, and gave us the idea of it. Though, when it questions itself, never stops prolonging and contradicting itself, but there is a thought in act which is no little thing, and which we have to take into account. The critique of human understanding destroys only if we cling to the idea of a complete or absolute understanding. If on the contrary we rid ourselves of this idea, then thought in act, as the only possible thought, becomes the measure of all things and the equivalent of an absolute. The critique of passions does not deprive them of their value if it is carried to the point of showing that we are never in possession of ourselves and that passion is ourselves. At this moment, reasons for doubting become reasons for believing. The only effect of our whole critique is to make our passions and our opinions more precious by making us see that they are our only recourse, and that we do not understand ourselves by dreaming of something different. Then we find the fixed point we need (if we want to bring our versatility to a stop) not in the bitter religion of nature (that somber divinity who multiplies his works for nothing), but in the fact that there is opinion, the appearance of the good and true. Then regaining nature, naiveté, and ignorance means regaining the grace of our first certainties in the doubt which rings them round and makes them visible. Volubility, versatility, visibility; a truly astonishing passage. Focus for now on the two Critiques, one of human understanding and one of human passion. Merleau-Ponty reads Montaigne as a Critical philosopher, even as anticipating Kant’s first two Critiques, although Kant’s Critiques and Montaigne’s are deeply different. But the idea of reading Montaigne as a Critical philosopher, for me a philosopher of limits, is deeply right. Kant cartographizes transcendentally, finding reflection’s limits as reflection plays out. 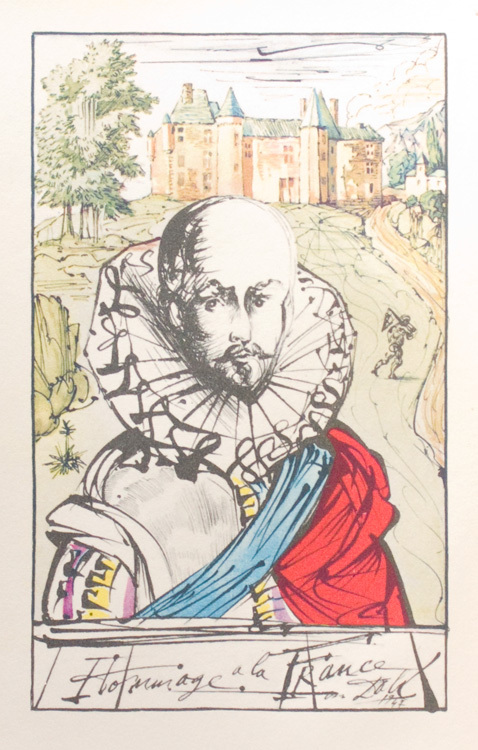 Montaigne cartographizes existentially, finding his own limits as he plays himself out. And what he finds is that unacted reflection plays itself out in a sickly, kill-joy chortle, chilling life itself in the pallor of thought; and that unreflected action plays itself out in pointless passions, vaunting vanities as lasting values. Thought in act, as Merleau-Ponty says, becomes the equivalent of an absolute. Thought in act: the meeting point of the two Critiques, a place from which we can see what is genuinely precious and can see how we distort it, devalue it, by dreaming dreams of complete possession of ourselves in understanding or of completely dispossessing ourselves of our passions. The point is not, of course, that thought in act is always true–‘always true’: both not false and not faithless. We are all too often false and faithless. But when we manage thought in act, we make ourselves available to the world and to others while remaining handy to ourselves. Such availability and such handiness are not to be understood as complete self-possession or as complete apatheia. In fact, such availability and handiness are irreconcilable with complete self-possession or complete apatheia, since thought in act is humble and vulnerable, not sequestered, aware of our opacity to ourselves and of the permanence of our passions. We have to acknowledge that we are ringed round with doubt, like an island in an ocean, but acknowledging that allows us to start westward to Eden, to leave our nodding dreaminess. It allows us to once again be graced by our first certainties: graced—acknowledging that here where we are and there where we are going there are no Pelagian certainties. Our original sin is our conviction that we can achieve the absolute. All we can hope for is to live in an absolute relationship to it. And, surprisingly perhaps, that requires that we live in a relative relationship to ourselves, without derision never taking ourselves fully seriously, never forgetting that we are investigators without knowledge, magistrates without jurisdiction, and, all in all, the fools of the farce. « The Logic of Apophasis? Wow. You must write a book now. I guess it had to happen. Eventually I would turn out to be a Continental philosopher. Flattered by the mention, though. quick, you had better analyze something! Your professional identity post is my life-line now, j!